Max whistled as he left the office. “A whole week!” he thought with excitement. “I have a whole week of vacation on the beach!” He had been looking forward to this vacation for months. He was going alone, with just some good books to keep him occupied while he worked on his sun tan. That evening he finished packing, loaded up his car, and set off for the beach. When he arrived a couple of hours later, it was nearly dark. He walked into the small office building and told the woman that he had a reservation for a beach house. Max sighed in exasperation. This was supposed to be his perfect vacation, and already things were going wrong. 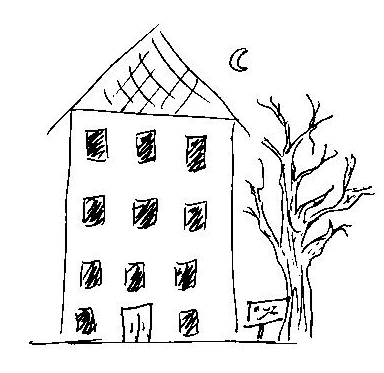 When he drove up the road to find the hotel the woman had mentioned, he found nothing except an old, dark, tall building. Was this the hotel? “Hello?” Max called into the darkness as he opened the squeaky door. Clearly no one was working here tonight. In fact, it looked as if no one ever worked here. However, it did look like it had been a hotel at one time. Max turned on the lights and surveyed his surroundings. There were some old couches and chairs in the main room, and off to the side was a kitchen where guests could prepare their own food. He walked down the corridor and peeked into a room – it had a bed, a small table, a shelf, and even a TV. “This isn’t so bad,” thought Max, and he brought his suitcase into one of the rooms and started to unpack. It wasn’t long before the lights flickered and went out. Max decided to wait until the morning to unpack, and he climbed into bed. In the morning he woke up with sunlight streaming through the window onto his face. “Ah, what a beautiful day!” he exclaimed out loud. He grabbed one of his books and stepped outside. The weather was so pleasant that he decided to walk down to the beach instead of taking the bus. He spent a wonderful day on the beach. He relaxed on the sand, reading his book and soaking up the sun. He went swimming in the refreshing water, and he met some nice people who were also vacationing. But back at his “hotel,” he again had trouble falling asleep because of the soft whispers that floated through the corridors. All week it was the same. His days on the beach were perfect, but at night the whispers in the hotel always disturbed his sleep. Finally it was his last day on the beach. The next day Max had to go to work again. Max took his towel and sunglasses and headed down to the beach to enjoy his last day. He decided to rent a canoe for a couple of hours. 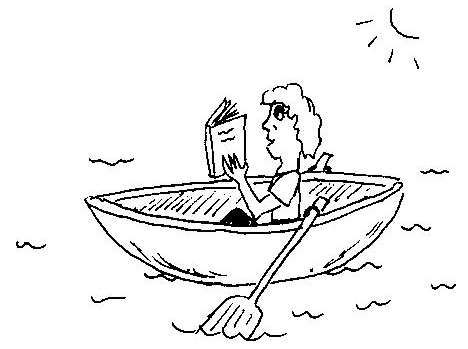 He rowed far away from the shore, then he stopped rowing to read his book. Suddenly he heard the sound of a motor. He looked up in time to see a small motor boat headed straight for him. “Hey! Wait! STOP!” Max cried, waving his arms. The last thing Max could remember was the crunching sound as the motor boat crashed into his canoe. The sun was already starting to set when Max woke up on the shore. “What happened?” he groaned, sitting up. Then he remembered the accident. When he checked himself over, he was amazed to discover that he didn’t have any cuts or bruises. “Wow, that was lucky!” he said softly. He stood up and started walking to the bus stop. He noticed some people not far away on the beach, and he wondered why none of them came to see if he was OK. While he was waiting for the bus, he saw some of his new friends walking on the other side of the street. Max waved to them, but they were too busy talking and they didn’t see Max. At last Max saw the bus coming, but to his annoyance, the bus didn’t stop for him! When the same thing happened with the next bus 15 minutes later, Max gave up and decided to walk back to his hotel. When he arrived, he was starving and he headed straight to the kitchen. Before he even walked through the kitchen door, he stopped in shock. There was already someone in the kitchen. “What are you doing?” Max asked suspiciously. “But when did you get here?” Max asked. “Oh, I’ve always been here,” said the stranger. Suddenly Max was aware of the sound of laughter and people talking. This hotel was full of people ... dead people. “I’m dead?” Max asked fearfully. “Don’t worry, it’s not so bad here,” said his new friend. Just then the door opened and two girls stumbled in. “Is this the hotel?” questioned the dark-haired girl. “Well, it doesn’t look so bad – we could stay here,” said the blonde. Max admired the dark-haired girl. She was pretty. “Too bad I’m dead,” he mumbled.